Easter egg hunt draws 250 kids and parents! Kids rush to gather Easter eggs filled with candy. Some of the eggs had tickets to collect prizes. Southwest Solutions sponsored a fun family event for Easter, featuring an egg hunt, arts and crafts, pizza and refreshments, face painting, prizes, and more. The event drew 250 kids and their parents from the community and was held at our St. Anthony’s building on Vernor and 25th. 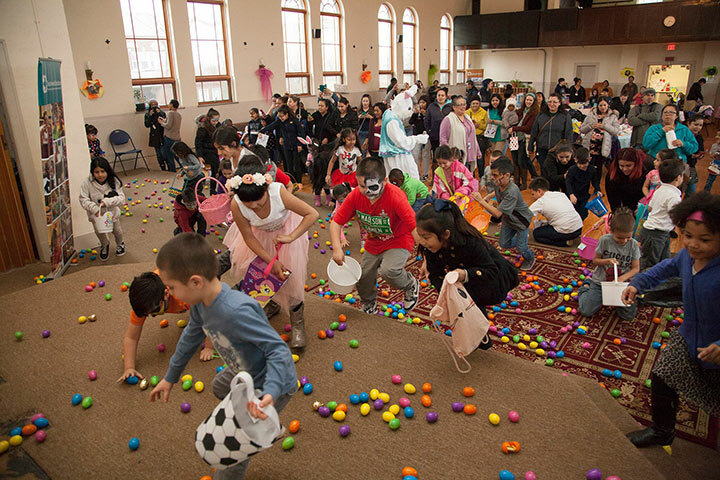 Kids participating in the Easter egg hunt collected the 2700 plastic eggs that were stuffed with candy by staff at our Children, Youth and Families (CYF) division. The event was organized by staff with the Family Alliance for Change Resource Hub, based at CYF, and our Housing staff. Special thanks to the Detroit Wayne Mental Health Authority and American Indian Health and Family Services.